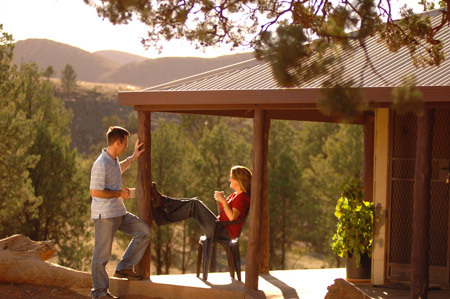 Overseers Cottage accommodation in the Flinders Ranges, Willow Springs Station. 20 Kms from Wilpena PoundFlinders Ranges of South Australia. Click on the image to go inside. ~~~~~~~~ Click here to view the layout of the cottage. 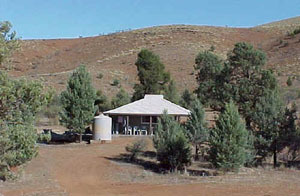 Willow Springs is approximately 21 Kms North of the Wilpena Pound or 71 Kms NNE of Hawker. The Overseer's Cottage is open planned with a Queen size bed in the living area. There are two single beds in a separate room. A Pillow, Quilt and Blanket are provided for each bed. You may need to bring extra blankets in Winter. Linen can be hired. Extra bedding may be required in the cooler months. A cot and highchair are available on request. Hired linen is sheets, pillow cases and towels. The kitchen/dining area has a gas/electric fridge, gas stove, microwave, gas heater, crockery, cutlery and cooking utensils. Pedestal electric fan is provided. Bathroom/toilet with shower and gas hot water.